Heat oven to 350°F. Grease or spray 11x7-inch (2-quart) glass baking dish. In 10-inch skillet, cook beef, 1 teaspoon salt, the pepper and garlic over medium heat, stirring occasionally, until beef is brown; drain. In 3-quart saucepan, heat water, butter, 1 teaspoon salt, the onion and oregano to boiling. Remove from heat. Stir in milk and dry potatoes just until moistened. Let stand about 30 seconds or until liquid is absorbed; whip with fork until fluffy. Spread half of the potato mixture in baking dish. Layer with beef and half of the tomatoes. 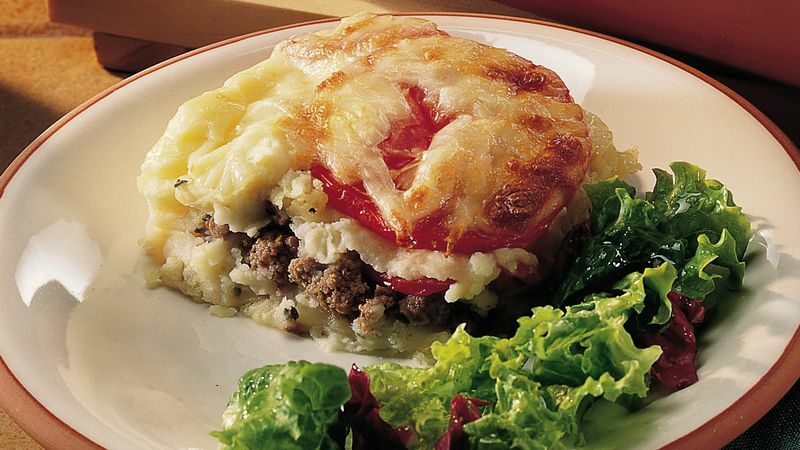 Top with remaining potatoes and tomatoes; sprinkle with cheese. Bake uncovered about 30 minutes or until hot and bubbly. Oregano means "joy of the mountain" in Greek, and the herb would be sorely missed in pizza or other Italian dishes. Power up this casserole with bulk Italian sausage instead of ground beef.